The hard work of graduates from criminal justice schools in Utah can have a positive effect on the state’s communities. For example, the Utah Foundation reports that between 1995 and 2014, the state saw a 34 percent decrease in violent crimes. Whether students want to become police officers or attorneys, they can develop the foundation for a successful career by enrolling in a criminal justice degree program. Continue reading to find out about the best criminal justice schools in the state, the professions that graduates pursue, and the expected job growth in the field. After Criminal Justice School in Utah : What's Next? 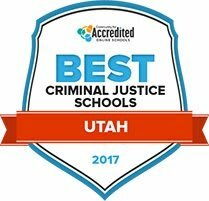 Finding reputable criminal justice schools in Utah is the first step toward building a successful career. There are a lot of schools out there, though, so we’ve looked into what programs are available and compiled a list of the best criminal justice schools in Utah. Use the list below to find out which schools rank the highest for 2017 based on program levels, tuition cost, enrollment, acceptance rate, and teacher-student ratio. Salt Lake Community College offers the Criminal Justice Associate of Science degree and the Criminal Justice Associate of Applied Science degree. The programs are operated through the college's Public Safety Division. Adults who plan to earn a four-year criminal justice degree are the program's target audience. Pre-law, criminal investigation, social science and criminal reporting are types of topics that students learn about. Classes that lead to the associate's degrees are taught at the Taylorsville Redwood, South City and Larry H. Miller campuses. Online classes roll out through MySLCC, a platform that is accessible via the college's main website. Annually, the online portal supports learning for about 10,000 students. Students seeking to achieve completion of a bachelor's or master's degree in criminal justice can do so through a program accredited by the Northwest Commission on Colleges and Universities (NWCCU) at Weber University. The degree focuses on four core facets of the criminal justice system and vides a broad foundation for careers within the criminal justice field. Concentrations on forensic science or crime scene investigation are additional degree path options within the field. The graduate degree option allows students to complete a master's degree in 12-18 months and is a fully online offering without a GRE or thesis requirement. Accredited by the Northwest Commission on Colleges and Universities, Dixie State University offers associate's and bachelor's degrees in criminal justice, in addition to minor and certificate options within the field. Criminology and digital forensics are options of concentration within the bachelor's degree, and are offered as minors as well. The University provides an added facet to the criminal justice department with the Dixie State University Computer Crime Institute _ an enterprise which serves to educate on the technological side of modern day crimes and facilitates career preparation by teaching methods of identifying and battling cyber crimes. Offering both majors and minors in criminal justice and forensic science, Utah Valley University provides several academic pathways to pursuing a career within the criminal justice system. Associate's degrees are also available for students beginning their career path, and many course offerings can be completed online for both degree levels. A training module titled Darkness to Light is included in all Introduction to Criminal Justice classes and allows students to gain valuable information and insight into the prevention and elimination of child sexual abuse. A security training certification program is also housed within the department. Whether pursuing an associate's degree, a bachelor's degree or a minor to complement a degree, criminal justice students can achieve their goals through the accredited programs at Southern Utah University. Offering invaluable resources such as a simulated crime scenes and courtrooms, cutting-edge law enforcement software, the program is centered on providing students with practical experience to apply to all fields of the industry. Small class sizes and faculty who possess real-world experience in the field provide a solid foundation for student success. The Criminal Justice Club and Criminal Justice Honor Society are additional resources for student collaboration, networking, and events. An interdisciplinary approach is the foundation of the justice studies program at Westminster College in Salt Lake City, which offers a bachelor's degree or a minor option. The curriculum focuses on examining multiple sociological, historical, and psychological facets of law and the justice system. The program has a proven history of supplying a foundation for continued education in law and graduate level academics. With a small campus and favorable student to teacher ratio, engagement and interaction are primary facets of the college and program mission. The institution is accredited through the Westminster College is accredited by the Northwest Commission on Colleges and Universities. Having trouble finding the right criminal justice schools in Utah for your needs? We’ve made the job easy for you by putting together the search tool below. Utilizing this tool will allow students to get information on schools based on the criteria that matters most to you—such as location, tuition level, type of school, and student population. Although all criminal justice jobs play a role in making the community better, some have more opportunities for employment than others. Below is information on the number of workers that can be found in different careers in the field, as well as the median salaries that are earned. Although students enrolled in criminal justice schools in Utah may have a desire to help people, they also have to keep an eye on whether or not they’ll be able to make a living after graduation. This section includes information on the projected job growth for specific criminal justice careers and the salaries that workers earn. In addition, the tables provide a comparison of Utah’s jobs and salaries against national averages. Who is Hiring Criminal Justice Graduates in Utah? Which areas have the most jobs for criminal justice graduates in the state? Not surprisingly, larger communities have the most opportunities in both legal and protective service professions. The table below provides data on the locations in Utah that have the largest number of criminal justice employees and the average annual wages they earn. Also, there are examples of specific employers where graduates may find work after finishing their degree programs. This page from the State of Utah’s website includes information on creating a successful business. Topics covered include writing an effective business plan, assessing the viability of a business idea, and the state requirements for operating a business. This guide provides information from the federal Small Business Administration. The Utah Division of Corporations & Commercial Code provides information on the process of registering a new business. The Utah State Chamber of Commerce connects business entities from around the state, providing networking and resources that promote a strong business climate. This page allows users to search licensed business entities in the state of Utah. The Office of Economic Development aims to attract new businesses and develop existing businesses, as well as promote tourism and film opportunities in the state of Utah. This local chapter of the SBA provides networking and financing opportunities for small business owners in Utah. This group provides training and resources to those in the corrections profession. In addition to managing offenders around the state, the Utah Department of Corrections provides services, such as education and treatment programs, designed to help them successfully reintegrate into the community. The probation and parole division supports the supervision of previous offenders and provides community resources and information. UPAN is a non-profit that aims to improve prison conditions for Utah’s inmates as well as streamline and simplify the justice system. Includes news and information about what’s going on in this branch of the Utah judiciary. Part of the Utah Department of Human Services, this agency has rehabilitation programs for youthful offenders. The Utah Court Reporters Association, or UCRA, helps to promote the profession by offering certifications, professional development, news, and advocacy support. From the juvenile court to the State Supreme Court, this website provides information on the work done in Utah’s judiciary system. The website also has self-help resources for those who need assistance understanding their rights. The Utah chapter of the Court Appointed Special Advocates provides volunteer advocacy services for neglected and abused children with the goal of helping them find safe, permanent homes. This non-profit provides mediation and conflict resolution services to low- and middle-income Utahns who have financial need. Since 1977, this organization has provided support for legal administrators, including meetings and education opportunities. The Utah Association for Justice promotes legal advocacy by providing professional development services to attorneys. Members of this association can take advantage of continuing education courses, events, publications, and job posts. This group provides pro bono legal services to those who cannot afford representation. Utah’s paralegals can take advantage of the UPA’s education programs, networking events, and job bank. Utah’s legal community can receive professional services from this organization. Motorists in Utah are kept safe on the roads thanks to the work that the Utah Highway Patrol does. From stopping drunk drivers to seizing drugs from traffickers, this agency strives to ensure that people do not commit crime on the highways. The Utah Department of Public Safety’s website includes information on how police officers are trained. Includes information on the process of obtaining a private investigator license from the Utah Department of Public Safety. Fosters fellowship and professional growth among the state’s police chiefs through networking and training programs. Benefits of joining this association include training for Utah police officers in areas such as leadership, hostage negotiation, and contraband seizure. The membership-based Utah Sheriff’s Association provides networking opportunities for the state’s sheriffs. Works to conserve and manage wildlife and educate the public about environmental issues. The Utah Department of Natural Resources lists its seasonal jobs on this page. Agency charged with protecting and conserving Utah’s wildlife, as well as granting licenses for hunting and fishing. This page provides information about employment opportunities with Utah’s state parks, including law enforcement.